This unique Serrata has sterile florets that all but cover the fertile flowers so we deem thee, Mophead! 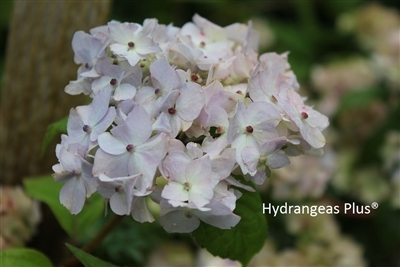 This is a petite charmer growing to just 3', it will be fantastic in a small garden or for your containers. Colorful changes happen all season long. Blooms start out white, age slightly pink or blue (pH dependent) then turn pink and green with pink center eyes. We've seen it re-bloom, too!